Looking to Sell your Used or Excess Cisco ASR 9000 Series Routers, Route Switch Processors, Ethernet Line Cards or Power Supplies? 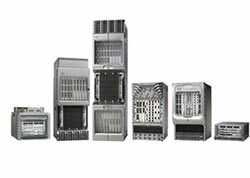 NetEquity.com is a leading dealer of Cisco ASR9000 Series Routing Equipment, including Chassis, Route Switch Processors, Ethernet Line Cards or fully configured systems. If you have recently completed an upgrade or turndown of your routing network, or have excess inventory of Cisco ASR9000 Series Routers, RSP's or line cards you want to sell, connect with a buyer agent today to receive a quote! Cisco ASR 9000 Series Aggregation Services Routers are available in several modular slot density versions including 4,6,10 and 12-slot. These core routers support 10GBe to 100 GBe Ethernet scale and density, and are expandable without the need for a complete chassis replacement. Cisco ASR 9000 line cards, offered in base and extended-scale configurations, are complemented by the non-blocking fabric (on the RSP for the Cisco ASR 9006, ASR 9010, ASR 9906, ASR 9910 and ASR 9904 Routers and on separate fabric cards for the Cisco ASR 9906, ASR 9910, ASR 9912 and ASR 9922 Routers), and by the innovative backplane, thermal, and power infrastructure on the chassis. The Cisco ASR 9000 Series has a modular power architecture available in both AC and DC. NetEquity.com Buys and Sells Cisco ASR9000 Series Router Products . If you are looking at Buying or Selling Cisco routers, we can help! Contact us today for a quote. Interested in a quote to buy a fully configured Cisco ASR9000 Series Router, Spare Route Switch Processor, SPA or Ethernet Line Card? NetEquity.com offers competitive reseller and end user pricing on Refurbished Cisco ASR 9000 Series Routers and accessories. To request a price quote, simply contact us or complete a quote request form online to get started. NetEquity Refurbished Cisco ASR9000 Series Routers are professionally remanufactured to Excellent Cosmetic Condition, configured and port tested by Certified Engineers and reset to Factory Default settings. Our Refurbished Cisco Routers include Rack Mounting Hardware and Power Cord, and are ready to install out of the box. In addition to offering extremely competitive pricing on Refurbished Cisco Routing Products, we also offer a full 1-Year replacement warranty for End Users on all Refurbished Cisco products. We also maintain a very large standing inventory of the most popular Cisco ASR9000 Router models and accessories, ensuring that we have what you need IN STOCK, with no long lead times. NetEquity.com wants to buy your used, excess or end-of-life Cisco ASR9000 Series Routers. If you've simply outgrown your Cisco ASR 9000 Routers or are interested in upgrading or trading in your old hardware, we can help. Contact us today to sell, consign or trade your unwanted Cisco ASR9000 Series equipment.